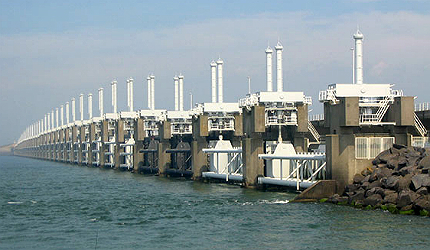 The Oosterschelde barrier / Eastern Scheldt storm surge barrier is the largest of the 13 dams which make up the Delta Works. Image courtesy of Vladimír Šiman. 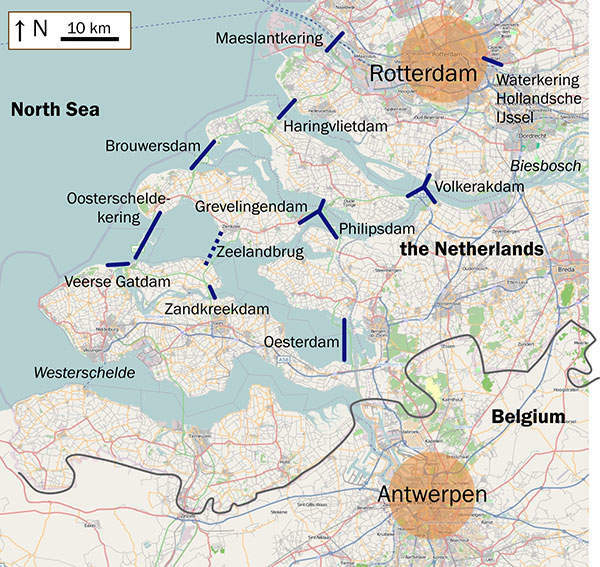 The project comprised of 13 dams, including barriers, sluices, locks, dikes, and levees, to reduce the Dutch coastline and protect the areas within and around the Rhine-Meuse-Scheldt delta from the North Sea. Image courtesy of OpenStreetMap.org. The project's structures improved the traffic movement between various islands, acting as bridges. Image courtesy of Raimond Spekking. Delta Works is a massive chain of flood protection structures that were constructed after the occurrence of the North Sea flood of 1953. The flood led to 8,361 fatalities and flooded nine percent of the farmland in the Netherlands. The project comprised of laying 13 dams, including barriers, sluices, locks, dikes and levees, to reduce the Dutch coastline’s size and protect the areas within and around the Rhine-Meuse-Scheldt delta from North Sea floods. The project was finally completed in 1997, at a cost of $5bn. The project was undertaken by the Department of Waterways and Public Works. The infrastructure provides flood protection, fresh drinking water and irrigation. The risk of flooding was reduced to one in 4,000 years. Delta Works is recognised as one of the Seven Wonders of the Modern World by the American Society of Civil Engineers. It included laying of 10,250 miles of dikes and around 300 structures. "The project was finally completed in 1997, at a cost of $5bn. It was undertaken by the Department of Waterways and Public Works." Studies were conducted and efforts were made to curb flooding along the estuaries of Rhine, Meuse and Scheldt, even before the devastating flood of 1953. The general idea was to shorten the coastline and convert them into fresh water lakes. The North Sea Flood affected the Netherlands, Belgium and England, leading to 2,551 fatalities out of which 1,836 were Dutch. The flood acted as a wake up call, immediately after which the Deltacommissie (Deltacommittee) was founded in February 1953, under direction of the Department of Waterways and Public Works. 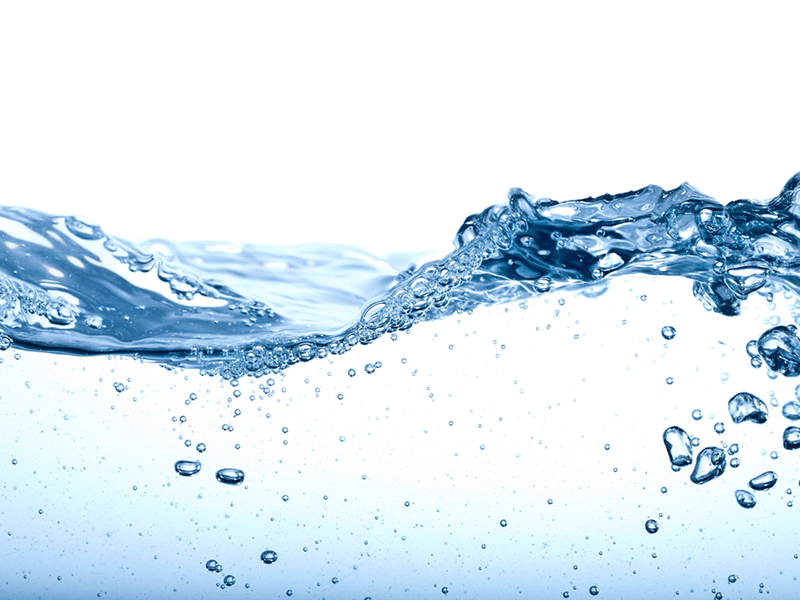 Deltacommissie was assigned with drawing up a plan to protect the areas from future flooding and provide clean drinking water, which was called Deltaplan. Delta Works is a part of the Deltaplan. The Delta Law was passed in 1959, for organising the construction of the structures. The project, which helped in reducing the coastline, consequently led to the use of less dikes. The dikes were shortened by about 700km. It helped in draining the low areas which flood regularly and regulated the flow of saltwater from the sea, providing both potable water and fresh water for irrigation. The project’s structures also improved the traffic movement between various islands, acting as bridges. Shipping was considerably improved, especially between Rotterdam and Antwerpen. The project also improved recreational facilities and generated employment. 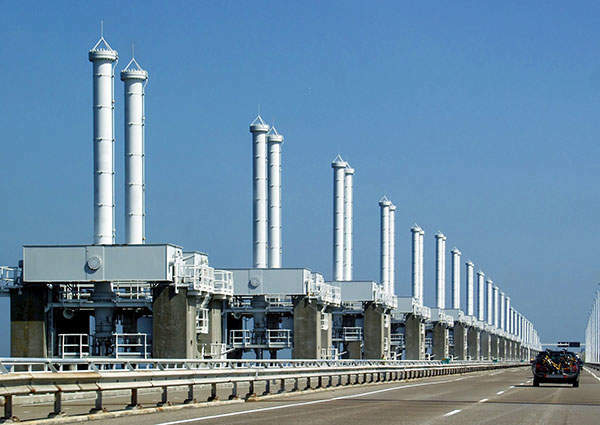 The Hollandse Ijssle storm barrier was the first structure of Delta Works, which began operating in 1958. The barrier provides safety to Randstad in the western part of the Netherlands, which is the lowest lying and most populated area of the country. "The flood acted as a wake up call, immediately after which the Deltacommissie (Deltacommittee) was founded in February 1953." Two more dams, the Zandcreek and the Veerse Gat, were closed in 1961. The two dams stop the flow of water from the North Sea and create the Veerse Meer (Lake of Veer), providing fresh water. The Haringvliet Dam was completed in 1971. It consisted of 17 sluice gates regulating the flow of water from the Rhine and Maas to the North Sea and protecting these rivers from being flooded by the North Sea. The dam also protects these river waters from being freezed during winters and controls the entry of salt water from the sea into the rivers. The Browers Dam, which was built using caissons and cableway, was completed in 1972. The dam created the Grevelingen Lake. The Grevelingen dam was completed in 1972. Built using caissons, the dam further helped in the construction of the Harindvliet Dam, the Browers Dam and the Oosterschelde barrier due to its strategic location. The Volkarek Dam was also constructed to complement the construction of the Oosterschelde barrier, the Browers Dam and the Harindvliet Dam. It was completed in 1969. The Maeslant barrier, which consisted of two steel doors, created a new waterway near the Hoek of Holland. It was completed in six years, from 1991 to 1997. The project also included various ancillary works and construction of structures along a number of tributaries and rivers connected to the North Sea. Construction of the structures in most cases of the Delta Works used caissons and synthetics. 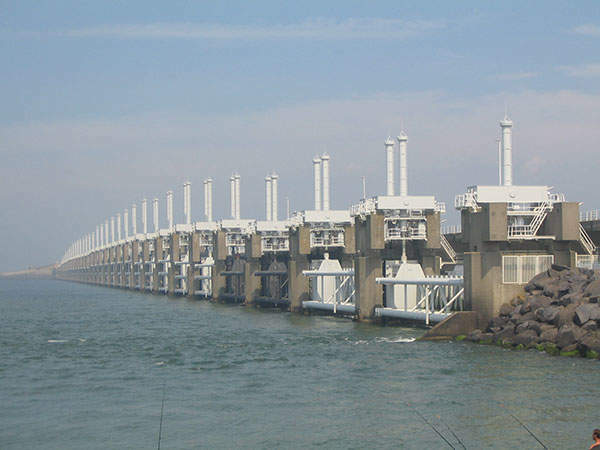 The Oosterschelde barrier / Eastern Scheldt storm surge barrier is the largest of the 13 dams under the Delta Works. The largest barrier in the world, it had cost £2.5bn to construct. It is located between the islands of Schouwen-Duivelend and Noord-Beveland. The dam was initially built as a closed one, but later changed into an open dam through the installation of sluice gates due to concerns about the saltwater environment and the fishing industry. It consists of 62 steel doors which are 42m wide each, to regulate the flow of water. The barrier was built by creating an artificial island in the middle of the estuary between the two islands. Its construction began in 1976 and was completed in 1986. The construction work was assisted by ships. The structure is expected to have a life span of 200 years to protect the Netherlands from flooding. The dam was constructed by a consortium comprised of Ballast Nedam, Boskalis Westminster, Baggermaatschappij Brejeenhout, Stevin Beggeren, Van Oord-Utretch and others. The ships involved in the construction of the barrier were Mytilus, Cardium, Ostrea and Macoma. The long awaited St Petersburg Flood-Prevention Facility was commissioned in August 2011. It comprises of 11 dams stretching 25.4km. Removal of the Elwha and Glines Canyon hydroelectric dams, currently underway in the state of Washington’s Olympic National Park, is not only the world’s largest-ever dam removal, but is also the second largest ecosystem restoration project in the American National Park System.